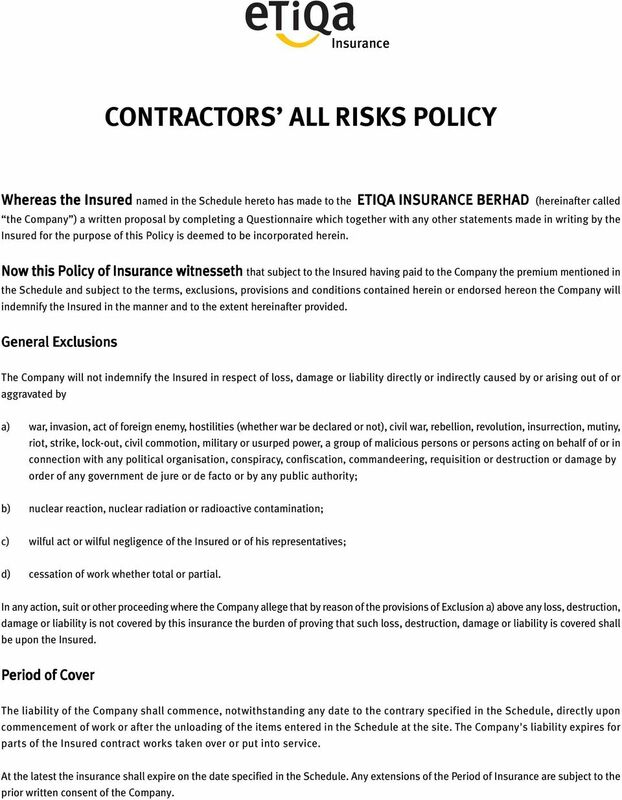 Download "CONTRACTORS ALL RISKS POLICY"
1 Insurance CONTRACTORS ALL RISKS POLICY Whereas the Insured named in the Schedule hereto has made to the ETIQA INSURANCE BERHAD (hereinafter called the Company ) a written proposal by completing a Questionnaire which together with any other statements made in writing by the Insured for the purpose of this Policy is deemed to be incorporated herein. 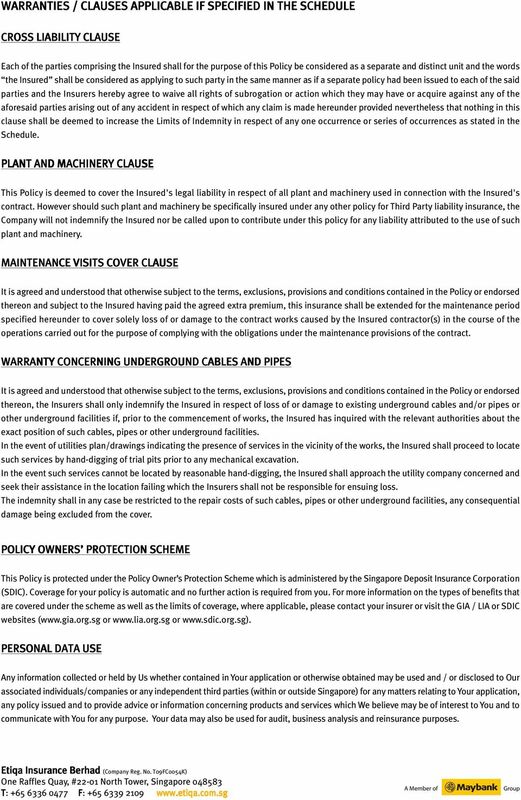 Now this Policy of Insurance witnesseth that subject to the Insured having paid to the Company the premium mentioned in the Schedule and subject to the terms, exclusions, provisions and conditions contained herein or endorsed hereon the Company will indemnify the Insured in the manner and to the extent hereinafter provided. General Exclusions The Company will not indemnify the Insured in respect of loss, damage or liability directly or indirectly caused by or arising out of or aggravated by a) war, invasion, act of foreign enemy, hostilities (whether war be declared or not), civil war, rebellion, revolution, insurrection, mutiny, riot, strike, lock-out, civil commotion, military or usurped power, a group of malicious persons or persons acting on behalf of or in connection with any political organisation, conspiracy, confiscation, commandeering, requisition or destruction or damage by order of any government de jure or de facto or by any public authority; b) nuclear reaction, nuclear radiation or radioactive contamination; c) wilful act or wilful negligence of the Insured or of his representatives; d) cessation of work whether total or partial. In any action, suit or other proceeding where the Company allege that by reason of the provisions of Exclusion a) above any loss, destruction, damage or liability is not covered by this insurance the burden of proving that such loss, destruction, damage or liability is covered shall be upon the Insured. Period of Cover The liability of the Company shall commence, notwithstanding any date to the contrary specified in the Schedule, directly upon commencement of work or after the unloading of the items entered in the Schedule at the site. The Company's liability expires for parts of the Insured contract works taken over or put into service. At the latest the insurance shall expire on the date specified in the Schedule. Any extensions of the Period of Insurance are subject to the prior written consent of the Company. 2 General Conditions 1. 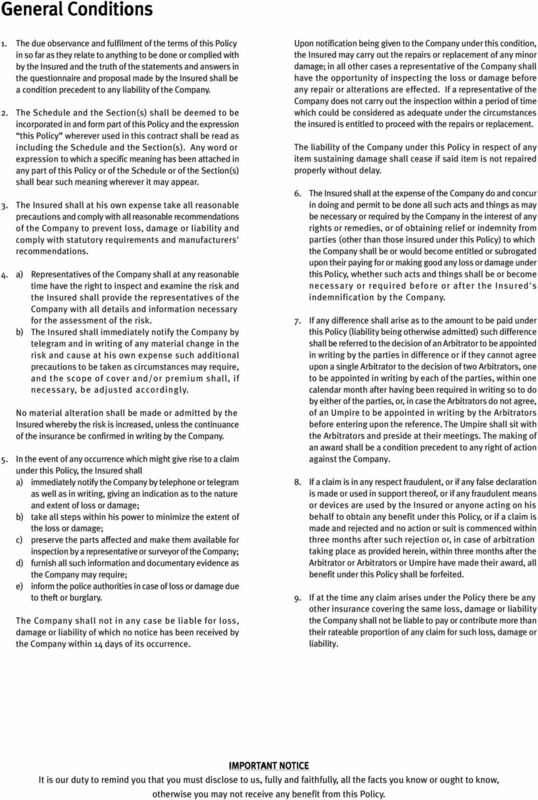 The due observance and fulfilment of the terms of this Policy in so far as they relate to anything to be done or complied with by the Insured and the truth of the statements and answers in the questionnaire and proposal made by the Insured shall be a condition precedent to any liability of the Company. 2. The Schedule and the Section(s) shall be deemed to be incorporated in and form part of this Policy and the expression this Policy wherever used in this contract shall be read as including the Schedule and the Section(s). Any word or expression to which a specific meaning has been attached in any part of this Policy or of the Schedule or of the Section(s) shall bear such meaning wherever it may appear. 3. The Insured shall at his own expense take all reasonable precautions and comply with all reasonable recommendations of the Company to prevent loss, damage or liability and comply with statutory requirements and manufacturers' recommendations. 4. a) Representatives of the Company shall at any reasonable time have the right to inspect and examine the risk and the Insured shall provide the representatives of the Company with all details and information necessary for the assessment of the risk. b) The Insured shall immediately notify the Company by telegram and in writing of any material change in the risk and cause at his own expense such additional precautions to be taken as circumstances may require, and the scope of cover and/or premium shall, if necessary, be adjusted accordingly. No material alteration shall be made or admitted by the Insured whereby the risk is increased, unless the continuance of the insurance be confirmed in writing by the Company. 5. In the event of any occurrence which might give rise to a claim under this Policy, the Insured shall a) immediately notify the Company by telephone or telegram as well as in writing, giving an indication as to the nature and extent of loss or damage; b) take all steps within his power to minimize the extent of the loss or damage; c) preserve the parts affected and make them available for inspection by a representative or surveyor of the Company; d) furnish all such information and documentary evidence as the Company may require; e) inform the police authorities in case of loss or damage due to theft or burglary. The Company shall not in any case be liable for loss, damage or liability of which no notice has been received by the Company within 14 days of its occurrence. Upon notification being given to the Company under this condition, the Insured may carry out the repairs or replacement of any minor damage; in all other cases a representative of the Company shall have the opportunity of inspecting the loss or damage before any repair or alterations are effected. If a representative of the Company does not carry out the inspection within a period of time which could be considered as adequate under the circumstances the insured is entitled to proceed with the repairs or replacement. The liability of the Company under this Policy in respect of any item sustaining damage shall cease if said item is not repaired properly without delay. 6. The Insured shall at the expense of the Company do and concur in doing and permit to be done all such acts and things as may be necessary or required by the Company in the interest of any rights or remedies, or of obtaining relief or indemnity from parties (other than those insured under this Policy) to which the Company shall be or would become entitled or subrogated upon their paying for or making good any loss or damage under this Policy, whether such acts and things shall be or become necessary or required before or after the Insured's indemnification by the Company. 7. If any difference shall arise as to the amount to be paid under this Policy (liability being otherwise admitted) such difference shall be referred to the decision of an Arbitrator to be appointed in writing by the parties in difference or if they cannot agree upon a single Arbitrator to the decision of two Arbitrators, one to be appointed in writing by each of the parties, within one calendar month after having been required in writing so to do by either of the parties, or, in case the Arbitrators do not agree, of an Umpire to be appointed in writing by the Arbitrators before entering upon the reference. The Umpire shall sit with the Arbitrators and preside at their meetings. The making of an award shall be a condition precedent to any right of action against the Company. 8. If a claim is in any respect fraudulent, or if any false declaration is made or used in support thereof, or if any fraudulent means or devices are used by the Insured or anyone acting on his behalf to obtain any benefit under this Policy, or if a claim is made and rejected and no action or suit is commenced within three months after such rejection or, in case of arbitration taking place as provided herein, within three months after the Arbitrator or Arbitrators or Umpire have made their award, all benefit under this Policy shall be forfeited. 9. If at the time any claim arises under the Policy there be any other insurance covering the same loss, damage or liability the Company shall not be liable to pay or contribute more than their rateable proportion of any claim for such loss, damage or liability. IMPORTANT NOTICE It is our duty to remind you that you must disclose to us, fully and faithfully, all the facts you know or ought to know, otherwise you may not receive any benefit from this Policy. 3 Section I - Material Damage The Company hereby agree with the Insured that if at any time during the period of cover the items or any part thereof entered in the Schedule shall suffer any unforeseen and sudden physical loss or damage from any cause, other than those specifically excluded, in a manner necessitating repair or replacement, the Company will indemnify the Insured in respect of such loss or damage as hereinafter provided by payment in cash, replacement or repair (at their own option) up to an amount not exceeding in respect of each of the items specified in the Schedule the sum set opposite thereto and not exceeding in any one event the limit of indemnity where applicable and not exceeding in all the total sum expressed in the Schedule as insured hereby. The Company will also reimburse the Insured for the cost of clearance of debris following upon any event giving rise to a claim under this Policy provided a separate sum has been entered in the Schedule. 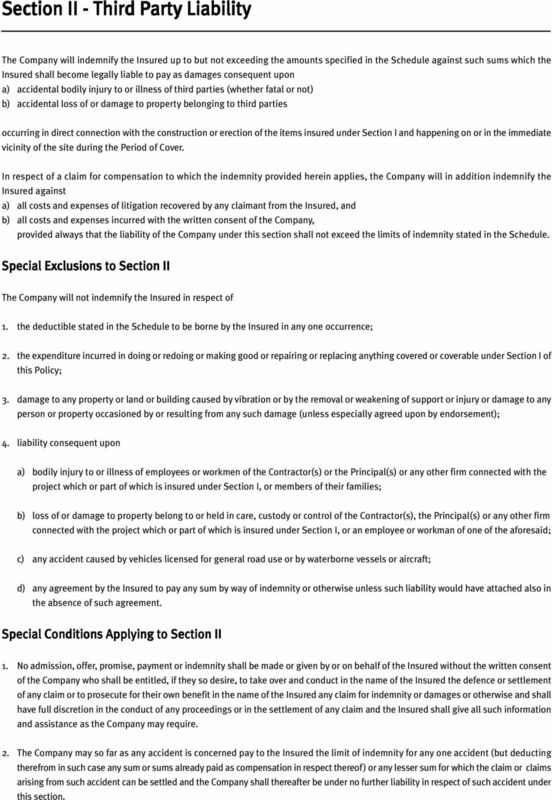 Special Exclusions to Section I The Company shall not, however, be liable for a) the deductible stated in the Schedule to be borne by the Insured in any one occurrence; b) consequential loss of any kind or description whatsoever including penalties, losses due to delay, lack of performance, loss of contract; c) loss or damage due to faulty design; d) the cost of replacement, repair or rectification of defective material and/or workmanship, but this exclusion shall be limited to the items immediately affected and shall not be deemed to exclude loss of or damage to correctly executed items resulting from an accident due to such defective material and/or workmanship; e) wear and tear, corrosion, oxidation, deterioration due to lack of use and / or normal atmospheric conditions; f) mechanical and/or electrical breakdown or derangement of construction plant, equipment and construction machinery; g) loss of or damage to vehicles licensed for general road use or water borne vessels or aircraft; h) loss of or damage to files, drawings, accounts, bills, currency, stamps, deeds, evidences of debt, notes, securities, cheques; i) loss or damage discovered only at the time of taking an inventory. Provisions Applying to Section I Memo 1. Sums Insured: It is a requirement of this insurance that the sums insured stated in the Schedule shall not be less than for item 1 : the full value of the contract works at the completion of the construction, inclusive of all materials, wages, freight, customs duties, dues, and materials or items supplied by the Principal; for items 2 and 3 : the replacement value of construction plant, equipment and construction machinery; which shall mean the cost of replacement of the insured items by new items of the same kind and same capacity; and the Insured undertakes to increase or decrease the amounts of insurance in the event of any material fluctuation in wages or prices provided always that such increase or decrease shall take effect only after the same has been recorded on the Policy by the Company. If, in the event of loss or damage, it is found that the sums insured are less than the amounts required to be insured, then the amount recoverable by the Insured under this Policy shall be reduced in such proportion as the sums insured bear to the amounts required to be insured. Every object and cost item is subject to this condition separately. 4 Memo 2 - Basis of Loss Settlement: In the event of any loss or damage the basis of any settlement under this Policy shall be a) in the case of damage which can be repaired - the cost of repairs necessary to restore the items to their condition immediately before the occurrence of the damage less salvage, or b) in the case of a total loss - the actual value of the items immediately before the occurrence of the loss less salvage, however, only to the extent the costs claimed had to be borne by the Insured and to the extent they are included in sums insured and provided always that the provisions and conditions have been complied with. The Company will make payments only after being satisfied by production of the necessary bills and documents that the repairs have been effected or replacement has taken place, as the case may be. 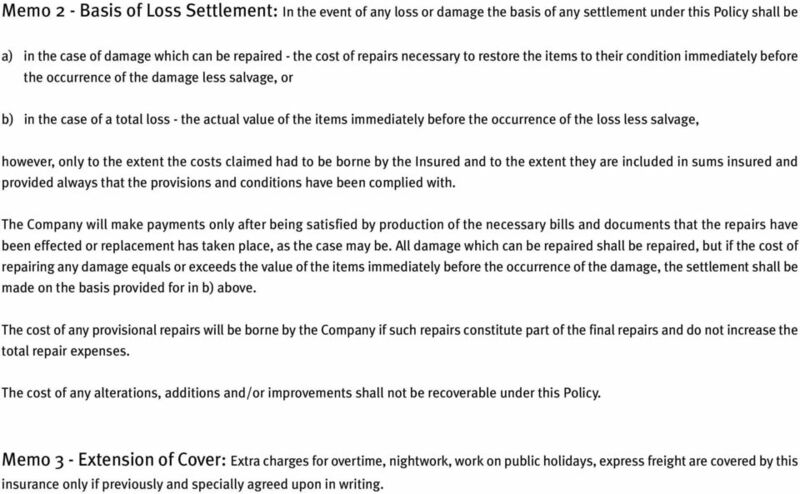 All damage which can be repaired shall be repaired, but if the cost of repairing any damage equals or exceeds the value of the items immediately before the occurrence of the damage, the settlement shall be made on the basis provided for in b) above. The cost of any provisional repairs will be borne by the Company if such repairs constitute part of the final repairs and do not increase the total repair expenses. The cost of any alterations, additions and/or improvements shall not be recoverable under this Policy. Memo 3 - Extension of Cover: Extra charges for overtime, nightwork, work on public holidays, express freight are covered by this insurance only if previously and specially agreed upon in writing. 5 Section II - Third Party Liability The Company will indemnify the Insured up to but not exceeding the amounts specified in the Schedule against such sums which the Insured shall become legally liable to pay as damages consequent upon a) accidental bodily injury to or illness of third parties (whether fatal or not) b) accidental loss of or damage to property belonging to third parties occurring in direct connection with the construction or erection of the items insured under Section I and happening on or in the immediate vicinity of the site during the Period of Cover. In respect of a claim for compensation to which the indemnity provided herein applies, the Company will in addition indemnify the Insured against a) all costs and expenses of litigation recovered by any claimant from the Insured, and b) all costs and expenses incurred with the written consent of the Company, provided always that the liability of the Company under this section shall not exceed the limits of indemnity stated in the Schedule. 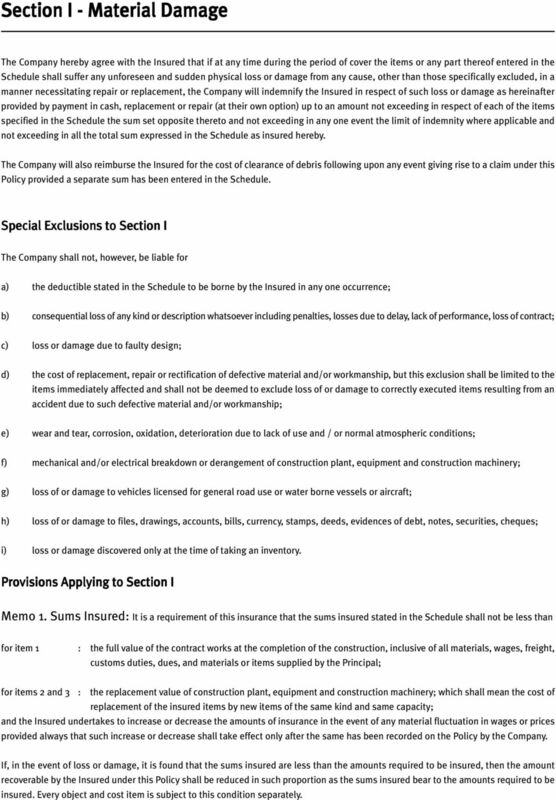 Special Exclusions to Section II The Company will not indemnify the Insured in respect of 1. the deductible stated in the Schedule to be borne by the Insured in any one occurrence; 2. the expenditure incurred in doing or redoing or making good or repairing or replacing anything covered or coverable under Section I of this Policy; 3. damage to any property or land or building caused by vibration or by the removal or weakening of support or injury or damage to any person or property occasioned by or resulting from any such damage (unless especially agreed upon by endorsement); 4. liability consequent upon a) bodily injury to or illness of employees or workmen of the Contractor(s) or the Principal(s) or any other firm connected with the project which or part of which is insured under Section I, or members of their families; b) loss of or damage to property belong to or held in care, custody or control of the Contractor(s), the Principal(s) or any other firm connected with the project which or part of which is insured under Section I, or an employee or workman of one of the aforesaid; c) any accident caused by vehicles licensed for general road use or by waterborne vessels or aircraft; d) any agreement by the Insured to pay any sum by way of indemnity or otherwise unless such liability would have attached also in the absence of such agreement. Special Conditions Applying to Section II 1. No admission, offer, promise, payment or indemnity shall be made or given by or on behalf of the Insured without the written consent of the Company who shall be entitled, if they so desire, to take over and conduct in the name of the Insured the defence or settlement of any claim or to prosecute for their own benefit in the name of the Insured any claim for indemnity or damages or otherwise and shall have full discretion in the conduct of any proceedings or in the settlement of any claim and the Insured shall give all such information and assistance as the Company may require. 2. The Company may so far as any accident is concerned pay to the Insured the limit of indemnity for any one accident (but deducting therefrom in such case any sum or sums already paid as compensation in respect thereof) or any lesser sum for which the claim or claims arising from such accident can be settled and the Company shall thereafter be under no further liability in respect of such accident under this section. This is a sample Policy document that provides full wording for all the covers we offer. GRENADA This is a sample Policy document that provides full wording for all the covers we offer. Once you have bought your Policy you will be provided with the documentation specific to what you have requested. Headings and marginal captions are inserted for the purpose of convenient reference only and are not to be deemed part of this Policy. 2. The Company will also pay all costs and expenses incurred with its written consent.